Quilter's Academy Vol. 5 Masters Year 10700 by Harriet Hargrave and Carrie Hargrave. Now that you have completed your Bachelor's level work by working through Volumes 1 through 4, it's time to advance your quilting studies to the Masters level. Your favorite instructors are back in this fifth book of the best-selling Quilter's Academy series. Embrace the beauty of medallion quilts as you study historic, award-winning, and original design examples. Learn advanced techniques and precision drafting and math that naturally build upon everything you've learned thus far. Working through the lessons at your own pace, you'll be challenged and inspired to design your own medallion masterwork. Learn how to make your own quilted medallion masterpieces with absolute confidence. This in-depth guide allows you to study at your own pace. 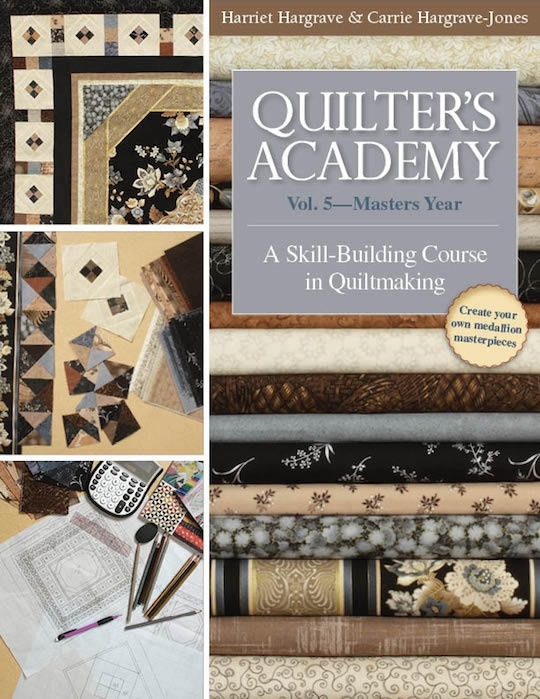 This fifth book in the Quilter's Academy Collection teaches: Precision techniques with advanced drafting and math; Invent your own stunning medallion quilts, sparked by historic and award-winning quilts; Color photos and illustrations. Soft cover; 144 pages.